Do You Want a Digital Product Delivery System that Fully Automates & Protects Sales and Downloads for ClickBank and PayPal Transactions? Do you know that hackers and thieves can easily download your products without paying for them - even if you use password protection? Do you know that ordinary people will give out the location of your download page and download links? Do you want to see how the Digital Product Guard Download System will quickly and easily solve these problems (and many more) for you? 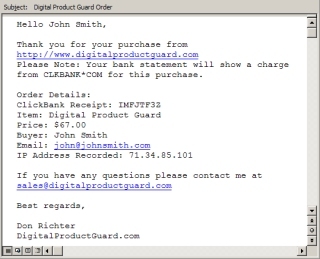 If you want to see how the Digital Product Guard Download System will protect your sales transactions and your digital products then keep reading and try the free $0.00 test purchase demonstration below. Digital Product Guard will automatically protect the payments for your sales and it will secure your digital products so they can only be downloaded by your authorized customers! ClickBank and PayPal are the two most popular payment processors used by Internet Marketers. However, ClickBank and PayPal do not provide adequate payment and digital product delivery protection for merchants that use their services. Plus, there are many other ways that your digital products can be stolen from your website/server that you need to be protected from. 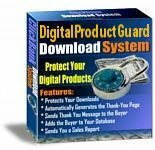 The Digital Product Guard ClickBank and PayPal Download System is a fully automated 'Thank You' page generator and download protection system that is more powerful than any other digital product protection method. In addition to protecting your sales payment transactions, your download pages and your download links, it also protects your digital products on your website/server from unauthorized access. The ClickBank and PayPal Download System also manages the entire payment process for you. It sends your customer a Thank You email that contains their payment information and it sends you a detailed Sales Report after every purchase. Plus, if you want, it will automatically add your customers to your database or to an autoresponder so you can follow-up with them and/or introduce them to other products and special offers! It is a stand alone product that does not require connecting to or communicating with another website/server other than the payment processor (ClickBank/PayPal). This provides better security because nothing needs to be shared or sent back and forth - so you only need to protect your website - you have no control over someone else's website. The download links are totally secured by a 160-bit algorithm, which is encrypted with a private (secret) key. The download links are replaced with a secure hash/code and the Secure Download System authenticates each secure link before it will allow the download (this method provides more security than any other download system). This process securely protects the real download location of your downloadable files, and the secure download links can also be set to expire at a predetermined time that you choose. The entire process is automatically preformed by this Secure Download System and you only need to set it up one time for it to secure all of your download links for you. By using this method there is absolutely no way an Internet user can find the actual location of your files. The secure download links cannot be accessed without going through the Secure Download System that captures the user's identifying IP address and sends you (the merchant) a sales report/download notification every time the Secure Download System is accessed/used. The only way to access the download page is through the Secure Download System and you can set the download page to have one-time access so nobody can return to, or share the download page. You can set the download location to be anywhere you want, it can be a local directory, a password protected directory, a directory at another website or on a different web server. Or, it can be a directory above/outside of the web server's root directory, which means it is impossible for any Internet user to access this directory without going through the Secure Download System (this method provides a lot more security than any password protected directory does). 2) The currency used for payment (it could be in US Dollars and/or in Foreign Currency). 3) That the payment was made to "your" PayPal account. 4) That the Payment Verification actually came from PayPal. Those are the 4 vulnerabilities in PayPal's payment system and the Digital Product Guard Download System will protect you from all 4 of them. And, in addition to that Digital Product Guard will ensure that the customer who made the payment is the only person who can access your download page. It has a feature that lets you email secure download links that can be set to expire at a predetermined time. Click here to test this feature. Right now it only costs $47.00 - the secure download link feature alone is worth more than that! With most other download protection systems the real location of the download page and/or the download links are exposed in the Browser's "History" folder and/or "Temporary Internet Files" folder which means they can be passed around without you even knowing it. Even if you don�t understand all of the technical aspects of the security features listed above the important thing to understand is the benefit, which is total protection for your products and your downloads. The Digital Product Guard ClickBank and PayPal Download System has all the important features you need and its superior technology will give you more protection (effective protection that really works) than any other download security product. That�s not a bunch of hype, that�s a fact! The following chart demonstrates what the Digital Product Guard Download System will do for you. The script collects and records the name, email address, and the IP address of the buyer. The script generates a protected 'Thank You' page that inserts the secure download links. Then it gives the verified buyer their instant download from your protected download location. Even at this step the script will not let the buyer Bookmark or see your real download location! Next, the script sends a Thank You Message to the buyer and a detailed Sales Report to you. Then, if you want, the script will add the buyer to your autoresponder to promote your other products! The Digital Product Guard Download System is fully automated! You don't have to manually send download instructions or a thank you message to your customers. You don't have to manually add them to your customer database or your autoresponder. You don't have to manually send them follow-up and/or promotional email messages. You don't have to worry about how to get repeat sales. You don't have to worry about thieves and hackers stealing your products. You don't have to worry about people passing around your download pages and download links. Digital Product Guard will automatically do everything for you! Take a look at the screen shots below. The image on the left shows what people will see if they try to reach the download page without paying! The following link is the location of the 'Thank You' page for the ClickBank and PayPal Download System: Click here to try and Download this product without paying! The image on the right is an example of a download page with secure download links that the buyer will automatically be sent to after their payment has been verified. You can customize the download page to match your website and say and/or contain anything you want. Also, if you want, you can have the buyer automatically added to your autoresponder! You can set access to the download page to expire in any amount of time that you want, or set it for one-time access so nobody can share the download page! The image on the left shows an example of the Sales Report email message that is sent to the merchant (you). You can turn this feature off if you do not want to receive these reports. The image on the right shows an example of the Thank You - Order Confirmation email message that is automatically sent to your customer. It contains complete information about the order that will make you look more professional. Plus, you can customize this message to say anything you want. The entire process is simple. You open the ClickBank and PayPal Download System script in any text editor, like Notepad, and modify the specified fields as described in the step-by-step instructions. Then you simply upload the PHP scripts and if you're using ClickBank you will need to enter your "Thank-you" page URL in your ClickBank Control Panel. If you're using PayPal you will need to turn on the Auto Return, PDT, and IPN features in your PayPal account. In a few minutes, you can automate your ClickBank and PayPal sales and downloads, and protect your digital products from hackers and thieves! No programming knowledge is necessary to use this PHP script. You just need to be able to edit/enter variables in PHP scripts and you need to be able to edit a Web page. Complete step-by-step instructions are provided that explain how to setup, customize, and upload your 'Thank You' page script. This is a Fully Automated System! It is Thief and Hacker proof. Nothing to program - just open it in a simple Text Editor and enter your information in the script. Works with all Web Browsers - it does not matter what Web Browser is used. Unlimited usage - You can create as many protected 'Thank You' pages as you want. You have nothing to lose with my risk free 100% satisfaction guarantee! There's absolutely no risk to you. If you aren't 100% satisfied (for any reason) simply contact me within 30 days of purchase and I will give you all your money back! "It's the best program of its kind on the market"
I just want to tell you how great I think your Digital Product Guard is. After searching the Internet and coming across tons of programs that are supposed to protect your product download and thank you pages, I would recommend yours over all the others and it's at a price anyone can afford. Easy to install and your tech support is tremendous.. It's the best program of its kind on the market. Personally, I would never consider selling downloadable products without this software! Your software script is absolutely amazing and has given me piece of mind that my downloadable products are in fact secure. I was very, very impressed with the patience you demonstrated when I asked for your assistance to ensure everything was set-up properly. Your additional suggestions were quite helpful too, and you definitely went above and beyond normal support issues. This newbie is one happy camper! "I love this software program!" Don, thanks for this excellent software program. Now my digital products are protected, and my payment processing, download deliveries, and customer follow-ups are totally automated. I love this software program! "Digital Product Guard is the best!" I tried several of your competitor's products but it turned out that none of them provided good download protection and they could not secure the digital products on my server like Digital Product Guard does for me now. Digital Product Guard was also easy for me to install because your detailed step-by-step instructions are excellent. Digital Product Guard is the best! "Digital Product Guard has saved me a lot of money!" I want to let you know that Digital Product Guard has saved me a lot of money! I use PayPal payment links on my website and after having a lot of people steal my ebooks I decided to try Digital Product Guard. Well, as soon I installed it the unauthorized downloads stopped, I no longer have any ebooks stolen and my sales have increased by 20%. "You've set new standards in customer service!" Your tech support was outstanding and your patience with a struggling newbie amazing. You've set new standards in customer service! "I cannot give enough praise"
I cannot express my gratitude for having discovered and invested in Digital Product Guard. I was paying quite a bit of money for a third party service to deliver my digital products through expiring links. After 5 years, and several thousand dollars in expenses for that service, I discovered Digital Product Guard. Having Digital Product Guard installed on my own site has allowed me to not only save money but also a lot of time because the digital products that are downloaded never have a problem, unlike the providers of my previous download service where a large number of downloads were corrupted, or the download links did not work. Rectifying those problems always took me away from other more important things. I cannot give enough praise, not only for the product, but also for the support that is provided. If you are looking for a solution to deliver your digital products safely and securely then get Digital Product Guard! "We wanted to thank you"
We wanted to thank you so much for being there at all times to answer any questions and for assisting us unhesitatingly during our setup process of your Digital Product Guard download protection software. As novices to the wide world of websites and eBook selling, we were fortunate to learn of your great security software before we fully launched our products online. Otherwise, if our download links, etc. had been stolen it would have been so disheartening to learn too late that our hard work and profits were going down someone else�s free drain. It is truly reassuring to know our virtual products are now safeguarded and that you are just an email away if we need you! Generates a protected 'Thank You' page that automatically inserts the secure download links! Collects and records the name, email address, receipt number, and the IP address of the buyer. Sends a Thank You Message to the buyer that includes their receipt and purchase information. Sends you (the merchant) a detailed Sales Report that includes all of the buyer's information. Allows the buyer to download while it keeps your download location and links protected! Adds the buyer to your database/autoresponder so you can follow-up and/or promote other products. Fast processing - directly between ClickBank/PayPal and your site - no other company is involved! You can customize the Thank You Messages, and the 'Thank You' and 'Unauthorized Access' pages. Works with every Web Browser! You can create as many protected 'Thank You' pages as you want! Protects your sales payments, your download pages, your download links, and your digital products! Automates the entire payment process for you! Makes you look much more professional. Saves you a lot of time and money! You'll have happy customers from the fast payment processing and instant download system! It allows you to make more money from backend sales by automatically building your customer database for you - so you can easily send them offers for other products! My 100% No Risk Offer: Get ClickBank and PayPal Download System today, try it for up to 30 days and if you are not totally satisfied I will refund your full investment, no questions asked. Order Now for Only $47.00 and get Instant Access! Plus, if you order by midnight you will receive the following bonus! Most companies charge their customers for updates, however with this bonus you will receive Unlimited Updates for free! Whenever Digital Product Guard is updated you will receive the new version for free. Click here to get this entire package right now! Remember, you have absolutely nothing to lose and everything to gain. Your satisfaction is 100% guaranteed! If you're not totally thrilled, you'll get an immediate refund! This may be your last chance to order before I raise the price.